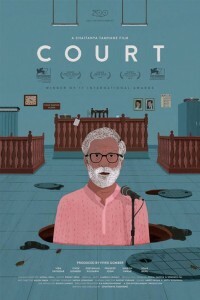 Winner of top prizes at the Venice and Mumbai film festivals, Chaitanya Tamhane’s Court is a quietly devastating, absurdist portrait of injustice, caste prejudice, and venal politics in contemporary India. An elderly folk singer and grassroots organizer, dubbed the “people’s poet,” is arrested on a trumped-up charge of inciting a sewage worker to commit suicide. His trial is a ridiculous and harrowing display of institutional incompetence, with endless procedural delays, coached witnesses for the prosecution, and obsessive privileging of arcane colonial law over reason and mercy. What truly distinguishes Court, however, is Chaitanya Tamhane’s brilliant ensemble cast of professional and nonprofessional actors; his affecting mixture of comedy and tragedy; and his naturalist approach to his characters and to Indian society as a whole, rich with complexity and contradiction.